I’ve spent the last two weeks enjoying the company of a head cold so I’ve had plenty of alcohol free days and stuck to drinking the odd beer and very little in the way of interesting wine. I do have a backlog of proper notes to type up, so fresh content is on its way! 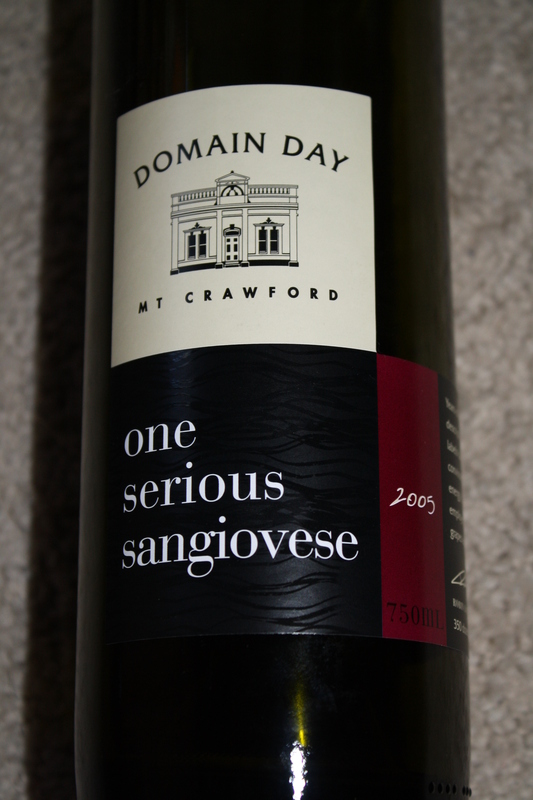 As the cold stuck in its claws, I opened a bottle of Domain Day 2005 One Serious Sangiovese which I’d found in a bottle shop, (slightly) reduced to $27. No tasting note today, as I drank the wine under the weather and figure that it’s hardly fair to either the wine or readers to attempt to pass sophisticated judgement. I will, however, say that I enjoyed it very much over a couple of nights. Based on my slightly befuddled state, I’d buy it again! However, I thought I’d use this as an opportunity to write not about a grape variety, but a little about a winery whose focus is very much on the alternative varieties. 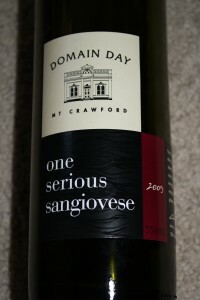 I first came across Domain Day when I was researching some wines for a client. In this instance, I was after a Saperavi. There’s actually a few South Australian Saperavi producers and in this instance, the Domain Day offering ticked quite a few boxes: it was one I hadn’t tried before, it was at the right price point and it was (relatively) easily available retail. I was pretty impressed with the wine – and, if I recall correctly, at least a couple of people in the resulting class had rated it highly too – so Domain Day as a producer was already on my radar when I saw the Sangiovese. In addition to the Saperavi and Sangiovese, Domain Day produces a Lagrein, sweet and dry Garganegas, and a few wines made from grape varieties with which you most likely will be familiar. The winery is at Mt Crawford, in the south eastern corner of the Barossa. In fact, it seems that it’s really pretty well subsumed by the Barossa as various erudite wine tomes* fail to mention it individually. At 450m the Domain Day vineyards are high enough to enjoy a cooler climate so they get to grow Riesling and Pinot Noir alongside the slightly quirkier varietals. Robin Day is the proprietor and winemaker and comes scarily well credentialled. He’s ex Orlando Wyndham and Pernod Ricard with plenty of overseas experience. Domain Day is a great example of a smaller, and dare I say it, less well known winery, with some formidable winemaking experience at the helm. Personally, I will always pick up a wine with which I am not familiar in preference to a big brand name. I’m on a bit of a mission to convince other wine buyers to do the same. A small, unfamiliar name doesn’t mean a lack of inside nous and competence. This wine was purchased from Cellarbrations, Flagstaff Hill for $27 (reduced). * By which I mean Sotheby’s Encyclopedia and the World Atlas of Wine.